Securiton’s marketing campaign in China has proved remarkably effective. The Middle Kingdom has taken a real shine to SecuriRAS ASD 535 aspirating smoke detectors for large premises and monitoring areas. Major construction projects in the cultural, high-tech and public transport sectors have been putting their faith in the reliability of Securiton early warning fire systems. Nanjing, the capital of eastern China’s Jiangsu Province, lies some 300 km upriver from Shanghai on the Yangtze River. As the former capital of the Ming Dynasty, this city of five million souls boasts a long history. 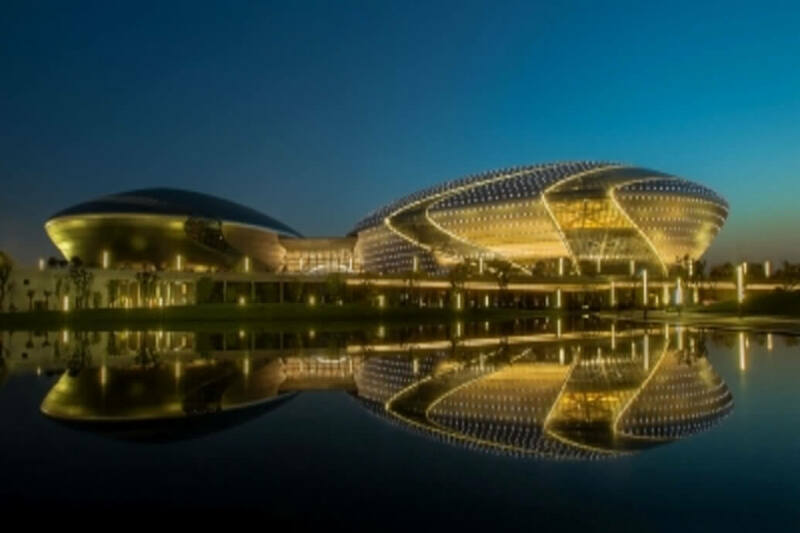 The Jiangsu Grand Theatre was inaugurated amid great celebrations last year in a bid to do justice to its cultural heritage. It ranks amongst China’s largest and most up-to-date concert and theatre venues. The opera house seats 2300 people, the concert hall 1500, the drama theatre 1000, the variety show hall 2700 and the conference facility large numbers of attendees. These large facilities are monitored by 48 SecuriRAS ASD 535 aspirating smoke detectors from Securiton. Despite the power of its built-in fan, the ASD is exceptionally quiet, making it ideal for monitoring large spaces where a quiet environment is of the essence. Chinese companies in the cloud-based sector are investing heavily in large up-to-the-minute data centres. Securiton has managed to convince the initiators of two major construction projects of the advantages of its aspirating smoke detectors. Located near Beijing International Airport, the new international headquarters building of the China Travelsky Holding Company houses one of the largest data centres in Asia. Travelsky is China’s leading services provider in the fields of IT and handling for the aviation sector. Here, 119 SecuriRAS 535 detectors provide an early warning fire indication for the building’s highly sensitive areas. Another facility where SecuriRAS 535 detectors are deployed – set to be one of China’s largest data platforms – is China Telecom’s data centre in the administratively autonomous city of Ordo in Inner Mongolia: here, 70 of these devices are safeguarding the sensitive servers. Thanks to the combination of the ASD network and the software tool, the operator benefits from a visualisation solution that monitors from a central point across all locations. Mass-transit metro systems in China’s conurbations are undergoing rapid expansion. Recent years have seen countless Securiton aspirating smoke detectors installed in the facilities of metro operators in a number of mega cities. Joining them last year were new lines in Shanghai (population 15 million) and Guangzhou (11 million): the extension of Shanghai’s metro line 9 includes depots with a shunting yard and maintenance workshops, which incorporate 128 SecuriRAS ASD 535s; the depot of Guangzhou’s line 9 is equipped with 62 such devices. Guangzhou also benefits from the software tool, which displays live data from the aspirating smoke detectors on the computer, thus making complex events quick to appraise.